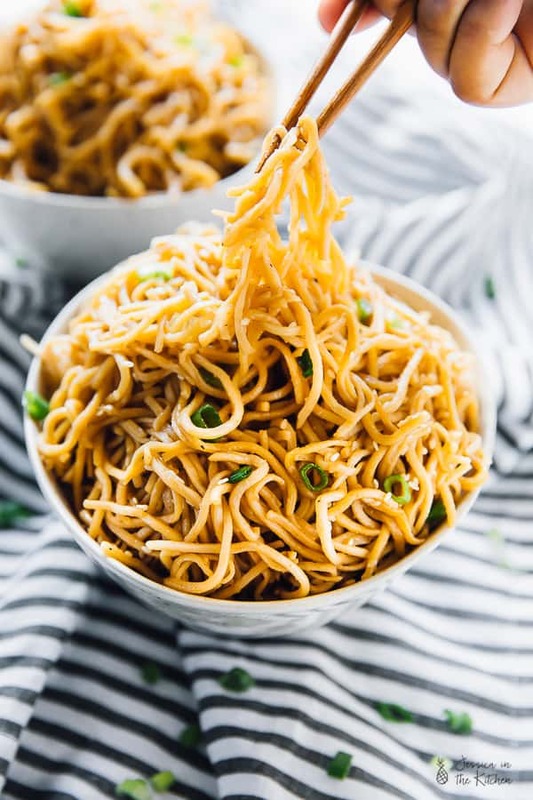 Lightly sautéed sesame noodles tossed in a maple ginger sauce that makes a quick and easy take-out style dinner in 15 minutes! You know those meals you just can’t forget about? These Sesame Noodles have been on my mind since 2014. You see, back in 2014, before Jessica in the Kitchen, I made these noodles in a honey ginger sauce. They grew to become one of the more popular recipes on my then blog Jessiker Bakes. For good reason too. Cheap? Yes. Easy? Yes. Flavour? Yes. Check, check, check. I have no reason why I haven’t made them again and it wasn’t until I was browsing through old posts that I realised I needed to make an updated version for you guys. 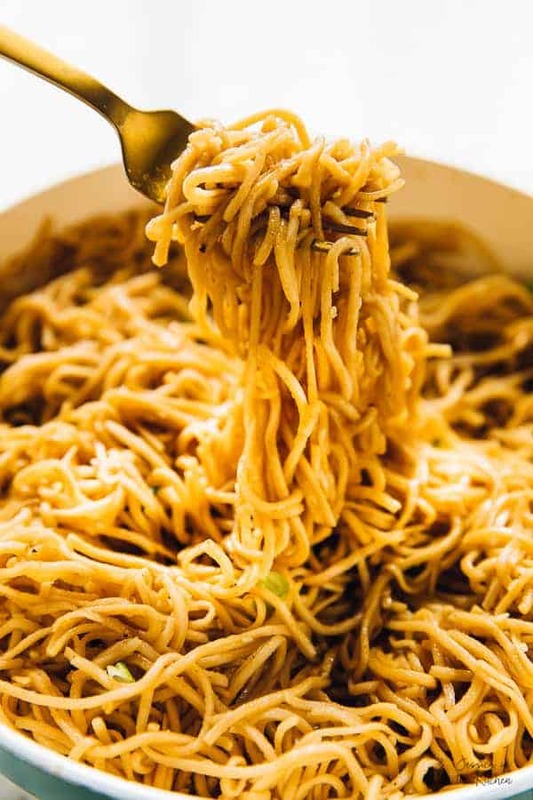 Because we all deserve some saucy Asian noodles. If you’re a lover of ramen, this will be right up your alley. Rest assured that I will also be sharing a ramen recipe with you guys in the near future, because I am an avid ramen lover. In fact, ever since Gav turned vegan and has been cooking up a storm, my general love of Asian food as basically tripled. 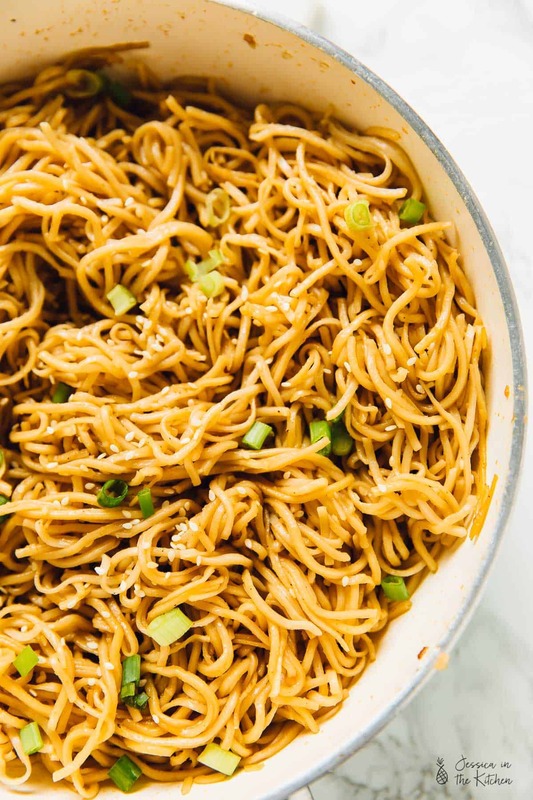 I think that’s one of the reasons why I knew I needed to make these Sesame Noodles with Maple Ginger Sauce for you friends. That and the fact I made this three times in one week pretty much convinced me that it would be near criminal not to. I promise I won’t blabber on and on before getting to the recipe but we need to talk about that sauce first. This is definitely my favourite version of my maple ginger sauce. It’s an adaptation on the sauce I used for the Sticky Sesame Cauliflower Wings, and a good one at that. It thickens up beautiful over these noodles, plus gives you some extra sauce if you’re like me and LOVE some saucy noodles. It’s a beautiful combination of salty soy sauce flavours and sweet maple syrup hit with a punch of ginger. As usual, you can switch it up. Want it saltier? Add more liquid aminos/soy sauce. Sweeter? Spicier? It’s all up to you. Actually, next time I’ll be using ramen noodles for this because I am now obsessed with trying this sauce and noodle combination in as many ways as possible. Needless to say – it’s become a staple in our household, and I hope it does in yours too. Eat up and enjoy, friends! Whisk all the ingredients together for the sauce. Set aside. Allow a pot of salted water to come to a boil. Add the noodles and cook and drain and cool according to your package's directions. Heat the sesame oil in a large pan over medium high heat. Add the noodles and stir until they begin to simmer, about 2 minutes. Add the maple ginger sauce and stir, coating the noodles in it. Allow the sauce to cook with the noodles for 2 more minutes on medium low heat. Remove from heat and add chopped scallions and extra sesame seeds. Serve immediately. I’m trying a new section to help you keep my recipes within your price range. 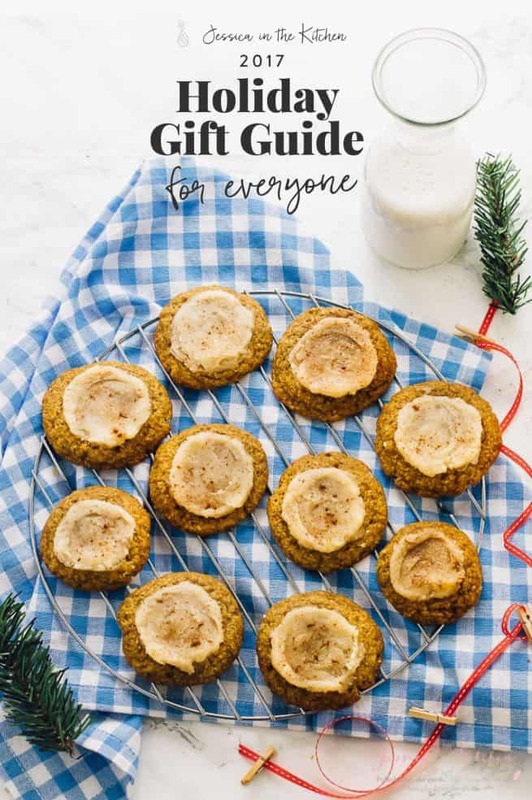 You can swap out the maple syrup for any vegan sugar replacement. Organic agave syrup is so much more cost effective than maple syrup and works really well here. Alternatively you can sub it for some unrefined brown sugar too, which is also more cost effective. 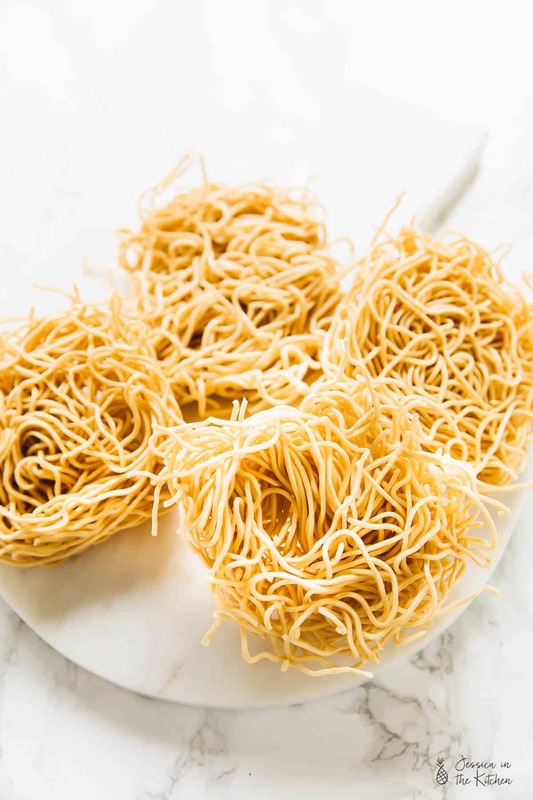 These are my FAVOURITE brown rice noodles! So happy you enjoyed Jennifer!! Oh I love the sound of edamame with this!! You’re so welcome and thanks for your feedback! Jessica, this is so good I can’t even imagine my life as I know it without this being a regular part of it. My hubby and I just love this so much. I have made it twice this week both times with regular pasta and veggie combinations: mushrooms, broccoli, zucchini, snap peas, carrots etc. I used coconut aminos and agave as I had no maple syrup. Thank you so much for this. Again. 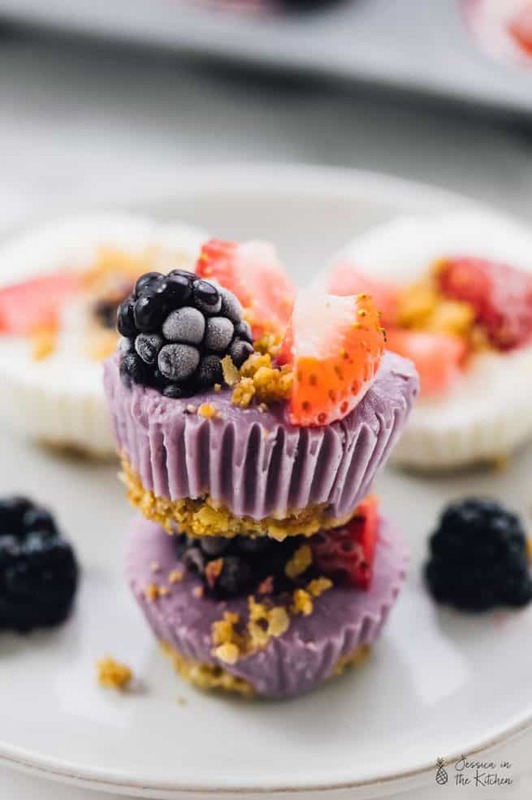 another great recipe from you! Aww I am so incredibly happy to hear this! Love your combinations so much. You’re so welcome and thanks for your feedback!! Boy, I need to quit reading your posts when I am hungry! 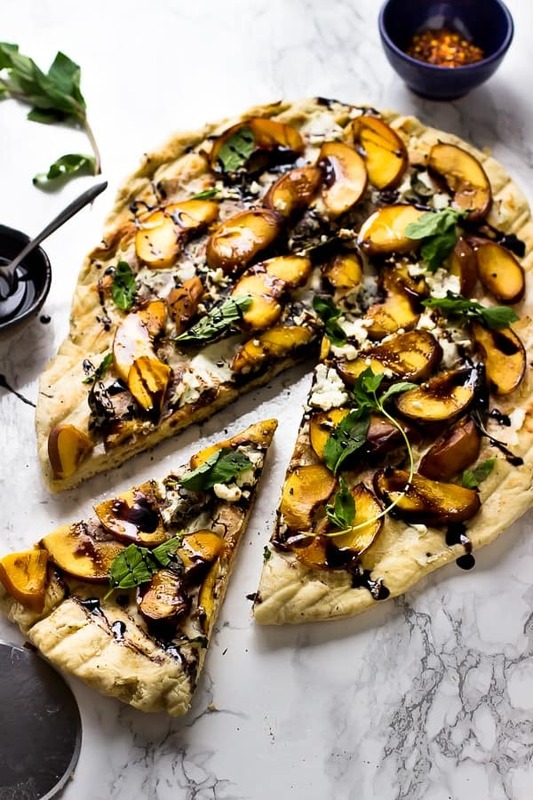 This looks so amazing…. my stomach literally growled as I was reading this post. LOL. Hahaha thank you so much!! I just made this and it was SO good. Next time I will marinate some tofu in the maple ginger sauce and saute it up with the noodles. I used soba noodles. YUM! I’m so happy to hear that!! Oh that sounds so great for the tofu!! I made this the other night with mushrooms and broccoli–it was soooo delicious! And so easy! This had definitely made it into my regular rotation. I’ve already shared the recipe with family who have made it and loved it! Thanks for sharing! Wow Thank you so much Alex! We’re so happy that you and your family enjoyed our recipe. Thank you for leaving a comment. Hey Jessica. Tried these noodles this weekend. They were delicious and easy to make. My 2.5 yr old daughter loved them too. Great recipe. This is great! Thank you for leaving such a nice comment Jennifer!